Valve’s card game Artifact is coming out in November. Recently, the Artifact Twitter account has been tweeting out designs for some of the cards alongside explanations of how they work. On September 26, that included a card called “Crack The Whip,” the text of which begins “Modify a black hero...” Today the name of the card was changed. In the context of the game, “black” isn’t being used racially, but rather to refer to cards of a certain color with a thematic connection. 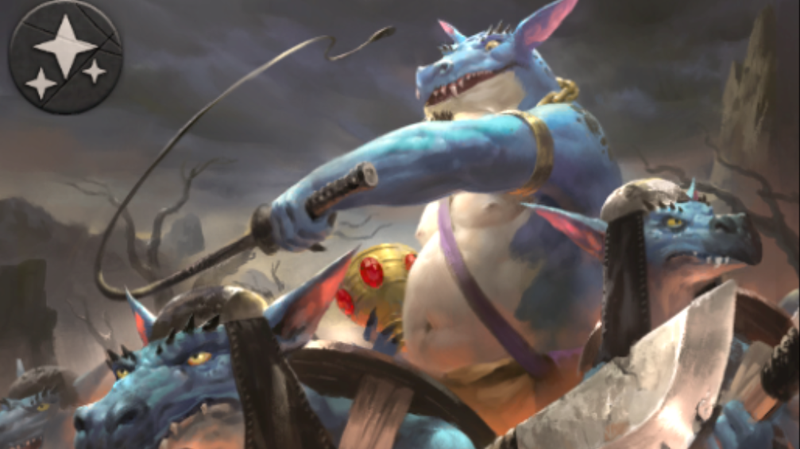 Crack The Whip’s illustration is of a big blue lizard creature whipping a group of smaller blue lizard creatures on a battlefield. The words themselves though, when taken together, read like an allusion to slavery and the subjugation of people of color by whites. People following the game, such as the commenters on ResetEra, noticed the connection. “How do people not catch these things?! ?” one of them wrote. “Like I’m oblivious at times but even I can see the problem here.” The responses to the initial Artifact tweet saw the obvious problem as well. “A card called Crack the Whip that modifies black heroes...guessing there’s not a lot of diversity over at the Artifact offices,” reads the first response..
Artifact is currently in closed beta on Steam and set to release on November 28.